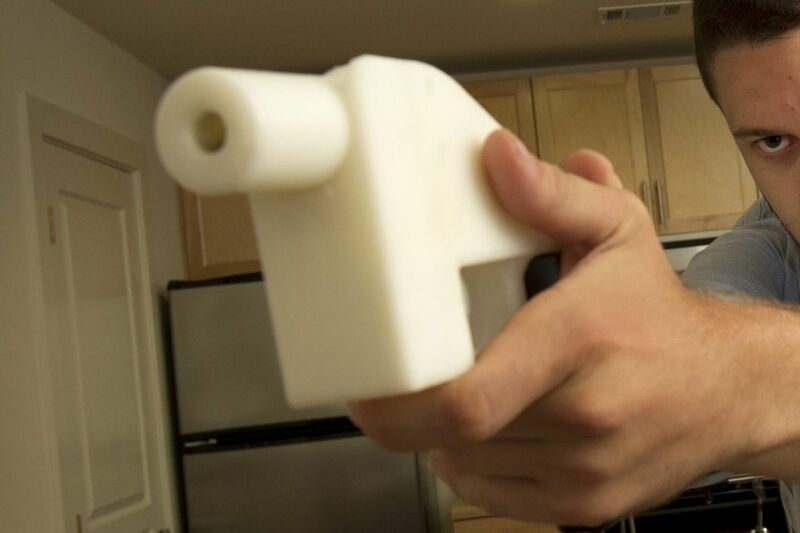 A plastic pistol completely made on a 3D-printer at a home in Austin, Texas. A coalition of gun-control groups has filed an appeal in federal court seeking to block a recent Trump administration ruling that will allow the publication of blueprints to build a 3D-printed firearm. After a Texas group last week posted "blueprints" that allow people to make their own guns with the use of a 3D-print, Pennsylvania and New Jersey joined eight other states Monday in a legal bid to keep their residents from accessing the files. The states and the District of Columbia signed on to a lawsuit filed by the State of Washington against the nonprofit Defense Distributed, one day after an emergency court challenge in Philadelphia by Pennsylvania Attorney General Josh Shapiro led the group to temporarily agree "to refrain from posting new information and to block all information from being accessed in Pennsylvania." New Jersey Attorney General Gurbir Grewal, meanwhile, sought a separate temporary restraining order Monday in Superior Court against the Defense Distributed and its director, Cody Wilson, building on a cease-and-desist letter he sent them last week. Wilson has been battling with the federal government since 2013, when he first put plans for the guns online and the State Department forced him to remove the files, which enable a user to make guns with a 3D printer. But a settlement this summer between the two sides ended the government's years-long ban on publishing the files, and Defense Distributed plans to publish several online by Wednesday. The conflict it has raised casts concerns about gun proliferation in a country where many already clamor for stricter gun laws against the constitutional-rights argument of gun-rights advocates. Though they require metal bullets, 3D printed guns are plastic and cannot be detected by metal detectors. They do not have serial numbers, meaning they cannot be tracked by law enforcement, like manufactured guns. Without background checks or the need to purchase the weapons from a licensed dealer, use of the technology also would allow anyone to obtain a gun, including people who are not legally permitted to have one, prompting outrage from gun-control advocates. Whether the files would be widely used was unclear. One gun-rights advocate said last week it didn't seem like a "very practical" path to obtaining a weapon. "First of all, you're going to plunk out thousands of dollars just for the printers," Erich Pratt, executive director of Gun Owners of America, told the Associated Press. "This is a very expensive route to go just to get a piece of plastic that will only last a round." In addition to the states' legal action Monday, 21 attorneys general signed a letter asking Secretary of State Mike Pompeo and Attorney General Jeff Sessions to withdraw from the settlement and prevent the downloads from being made available. "[W]e believe the settlement terms and proposed rules are deeply dangerous and could have an unprecedented impact on public safety. In addition to helping arm terrorists and transnational criminals, the settlement and proposed rules would provide another path to gun ownership for people who are prohibited by federal and state law from possessing firearms," they wrote. Members of both chambers of Congress indicated that they would introduce legislation on Tuesday to prohibit 3D printing of plastic firearms. And a group of Democratic senators last week sent a letter to Pompeo, urging him to block the publication of the blueprints. In New York, a state lawmaker is proposing legislation to make it illegal to make such guns without a gunsmith license and require that the guns be detectable by a metal detector, a bill that advocates are eyeing as a model for other states. According to gun-control group Moms Demand Action, people had sent more than 100,000 messages and calls of protest to the State Department as of July 27. "Both at the state and federal level, there are significant efforts being made to prepare legislative responses to this," said Adam Skaggs, chief counsel for Giffords Law Center to Prevent Gun Violence, who said he expected two bills to be introduced in Congress on Tuesday. The guns are "a dream come true for criminal gun traffickers… They're accessible to anybody, they're undetectable by metal detector technology, and they're untraceable by law enforcement." Wilson said it is his constitutional right to distribute the files, saying it is not just a Second Amendment matter but also his right to free speech. "Americans have the right to this data," he told the Inquirer and Daily News in a Sunday night interview. "We have the right to share it. Pennsylvania has no right to come in and tell us what we can and can't share on the internet." On Sunday, he sued New Jersey in a federal district court in Texas in response to the cease-and-desist letter, and also sued the Los Angeles city attorney, who has urged the State Department to prohibit the release of the downloads. "Alas, these state and municipal officers from across the country cannot veto Defense Distributed's constitutionally protected and federally licensed speech," the lawsuit stated. As recently as April, the federal government was still battling Wilson in court, according to a group of U.S. senators fighting the settlement. But a month ago, the Trump administration's State Department reversed course and settled the case. The NRA did not respond to a request for comment Monday, but other gun-rights advocates called it a victory. "Not only is this a First Amendment victory for free speech, it also is a devastating blow to the gun prohibition lobby," Second Amendment Foundation founder and executive vice president Alan M. Gottlieb said in a statement on the settlement. Now, any user in Pennsylvania who tries to access the blueprints on Defense Distributed's website receives this message: 451: We're sorry, but DEFCAD has been blocked in your location. "It's an existential threat to our state & we stepped in to stop it. The site is – & will remain – dark throughout PA," Shapiro tweeted Sunday. That depends on whether the attorney general can win a permanent injunction in court, which Shapiro's office has vowed to pursue. He filed an amended complaint Monday. Staff writer Tom Avril contributed to this article.